Toshiba Memory Corporation, the world leader in memory solutions, today announced the launch of the industry’s first  SSDs utilizing 96-layer, 3D flash memory. Sample shipments to OEM customers start today in limited quantities, and Toshiba Memory Corporation will gradually increase shipments from the fourth calendar quarter of 2018. 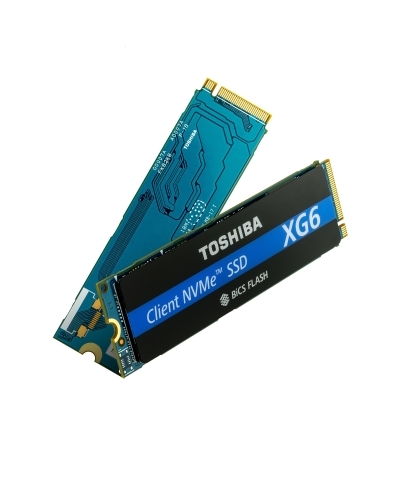 The new XG6 series client SSDs features a PCI Express® (PCIe®) Gen3 x 4Lane and NVM ExpressTM (NVMeTM) 1.3a interface. With the combination of Toshiba Memory Corporation’s fourth generation BiCS FLASHTM memory technology and SLC cache, the XG6 series delivers industry-leading sequential write performance  of up to 2960 MB/s  in client SSDs. Furthermore, the XG6 series delivers performance of up to 3180 MB/s sequential read , up to 355,000 random read and 365,000 random write IOPS . In addition to the higher speed, the XG6 series is also superior to the previous generation XG5 series in efficiency. The power consumption is maximum 4.7W in active mode  and 3mW during stand-by in the lowest power mode , which makes it suitable for power-sensitive mobile PCs. The new SSDs will be available in three capacities, 256GB, 512GB and 1024GB , all on a single-sided M.2 2280-S2 form factor. Self-encrypting drive (SED) models  supporting TCG Opal Version 2.01 will also be offered, making the XG6 series highly suited to a wide range of applications including ultra-mobile PCs that prioritize performance, and server-boot storage in datacenter and enterprise environments. The XG6 series will be exhibited at the Flash Memory Summit 2018 in Santa Clara, California, USA from August 7 to 9, in the Toshiba Memory America booth (Hall A, #307). *PCI Express and PCIe are registered trademarks of PCI-SIG. *NVM Express and NVMe are trademarks of NVM Express, Inc.
*All other company names, product names, and service names mentioned herein may be trademarks of their respective companies. Toshiba Memory Corporation survey, as of July 24, 2018. Toshiba Memory Corporation survey based on sequential read and write speeds of 128 KiB units, using XG6 1024 GB models under Toshiba Memory Corporation test conditions. Read and write speed may vary, depending on the host device, read and write conditions, and file size. Toshiba Memory Corporation defines a megabyte (MB) as 1,000,000 bytes and a kibibyte (KiB) as 2^10 bytes, or 1,024 bytes. Toshiba Memory Corporation survey based on random read and write speeds of 4 KiB units, using XG6 1024 GB models under Toshiba Memory Corporation test conditions. Read and write speed may vary, depending on the host device, read and write conditions, and file size. IOPS is Input Output Per Second (or the number of I/O operations per second). Typical active write power. Toshiba Memory Corporation survey, using XG6 1024 GB models under Toshiba Memory Corporation test conditions. Toshiba Memory Corporation survey under the test conditions of link power management state L1.2 in non-operation power state. Definition of capacity: Toshiba Memory Corporation defines a gigabyte (GB) as 1,000,000,000 bytes. A computer operating system, however, reports storage capacity using powers of 2 for the definition of 1GB = 2^30 bytes = 1,073,741,824 bytes, and therefore shows less storage capacity. Available storage capacity (including examples of various media files) will vary based on file size, formatting, settings, software and operating system, such as Microsoft Operating System and/or pre-installed software applications, or media content. Actual formatted capacity may vary. Availability of the SED model line-up may vary by region. Information in this document, including product prices and specifications, content of services and contact information, is correct on the date of the announcement but is subject to change without prior notice.